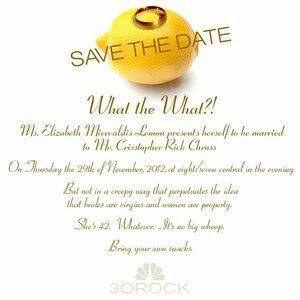 30 Rock Wedding Invite; Liz Lemon and Crisstopher Rock Chross Are Getting Married November 29th! 30 Rock Season 7 brings NBC's cult hit comedy to a close this spring. But before that final episode, Tina Fey's perpetually single Liz Lemon is going to finally get the thing she wants the most. Yes, that's right, Liz Lemon is getting married. On November 29th, James Marsden returns as Crisstopher Rock Chross, the one true love of Liz Lemon's long and tiresome life in /shows/30-rock/"Mazel Tov Dummies!". They will tie the knot at 8/7 central in the evening. It is sure to be a big event (though it wasn't deemed worthy of sweeps, which ends the week before). We got our 30 Rock wedding invite. Did you?